I seem to be baking a lot lately. Hubby, Rat Boy and myself are all fans of bready goodness, so my intention to become a better baker is being enjoyed by all. 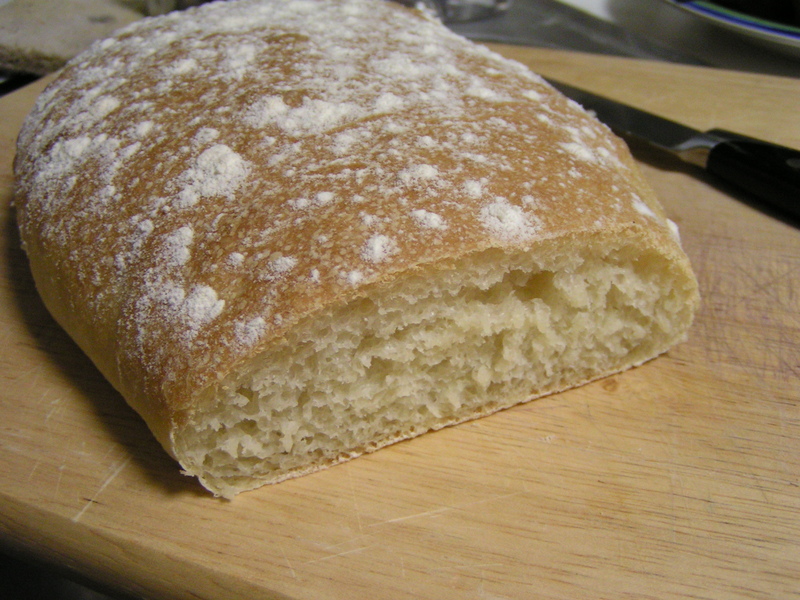 Today, I made one of my favorite types of bread…among other things. I’m not going to talk about the other things yet, because tomorrow we are going to visit a friend of mine who has been overseas for a while, and I don’t want to spoil the surprise about what I’m taking him and his family! 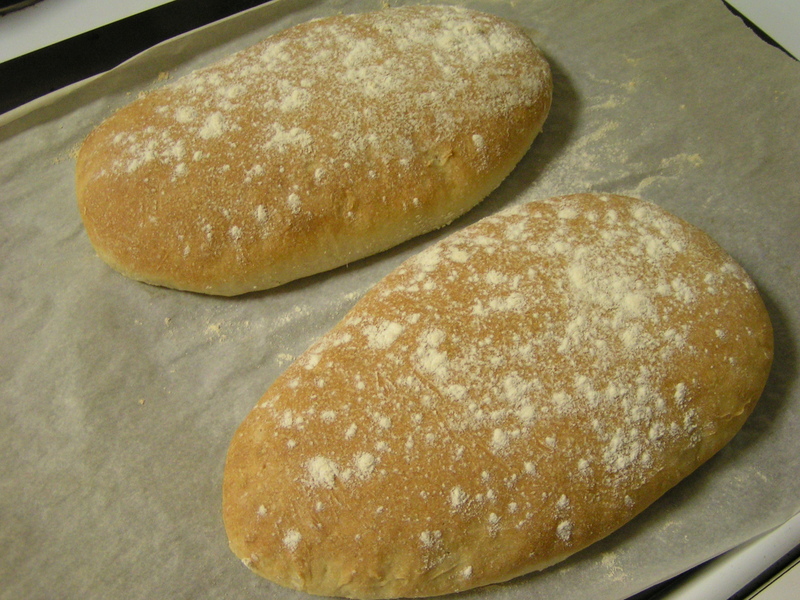 Anyhow, back to the ciabatta. I’m learning that all good bread requires a starter, which must be made in advance…that’s well in advance, like 12 hours is good. I’m learning why it seemed that, when I read Little House on the Prairie (a LONG time ago), Ma always was making bread. I’ve learned that I can make awesome bread, but then Hubby and Rat Boy eat it. I eat some too. Then I need to make bread again. Not really, Rat Boy has 2 hollow legs…he’s at that age. And Hubby and I have been swimming every morning. That makes working a night schedule so much more fun, especially when we can nap during the hottest part of the day. And then there’s yoga, too. I think North Americans, at least in the South, should adopt the practice of siesta. With bread. I didn’t take a gazillion pics of the bread making process. I’m thinking we all know what starter and dough look like by now, or we’d have stopped reading cooking blogs! So I’m just going to give the simple directions, and turn the world loose to make awesome bread. In a small bowl, stir together 1/8 tsp yeast and 2 tbsp warm water (about 110F). It’s really important that the water not be too hot, or you’ll kill the yeast, so I actually got a thermometer just to be sure until I learn what ‘warm’ feels like. Let the yeast and water mix stand for about 5 minutes until it looks creamy. Then add 1/3 cup warm water and 1 cup flour. I’ve started using bread flour to make bread, and it really makes a difference. Stir for 4-5 minutes, then cover the bowl with plastic wrap and set it aside for at least 12 hours, up to 1 day. This is a good thing to do before you go to bed! To make the bread, stir together 1/2 tsp yeast and 2 tbsp warm milk. Let it stand about 5 minutes. Dig out the dough hook for the mixer, and knead together the sponge, milk mixture, 2/3 cup warm water, 1 tbsp olive oil, and 2 cups flour until just moistened. 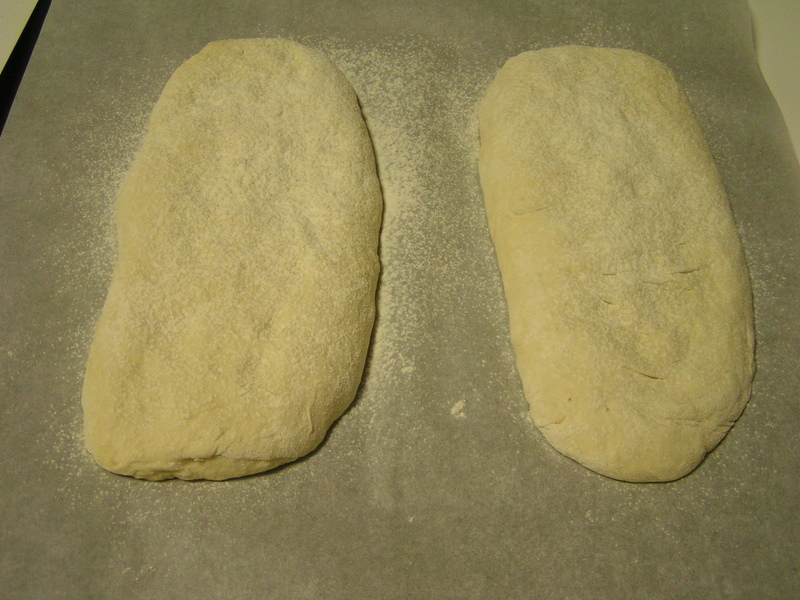 Add 1 1/2 tsp salt and continue to knead until the dough is smooth and elastic, about 8 – 10 minutes. Scrape the dough into an oiled container, cover with plastic wrap, and let it rise until doubled, about 1 – 2 hours. Turn it out onto a well-floured work surface, and cut it in half. You really want to work with as little extra flour as possible, as the best bread remains sticky until it goes into the oven, for the best texture. Form each half into an oval about 9 inches long. I like to do this on parchment paper, as I can just slide it onto the baking sheet, and use less flour to keep it from sticking to everything! Dimple the loaves with your fingers, and dust them with flour. Do not cover this with anything damp, as the flour + water = glue, and is NOT attractive! Just cover with a lint-free cloth, and set somewhere warm for another 1 – 2 hours, until they look doubled in bulk. Sources say that ‘room temperature’ for rising dough is 75F. They obviously don’t live in Texas. After they’ve risen…again…bake at 425F for 20 – 25 minutes. I’ve started putting an extra baking sheet under anything I put into the oven. This is partly due to my unpredictable apartment oven, and also because it really seems to help spread out the heat in any traditional oven. I’ve never baked in a convection oven, so I have no idea what the difference would be. I love Italian food. Someday soon, I’m going to figure out how to post the recipe at the end, so it’s printable. For now, I’m still trying out new techniques, tools, and trying to turn out yum-tastic food (that looks pretty) to share with the world. So I guess you’ll just have to follow along with the written directions! 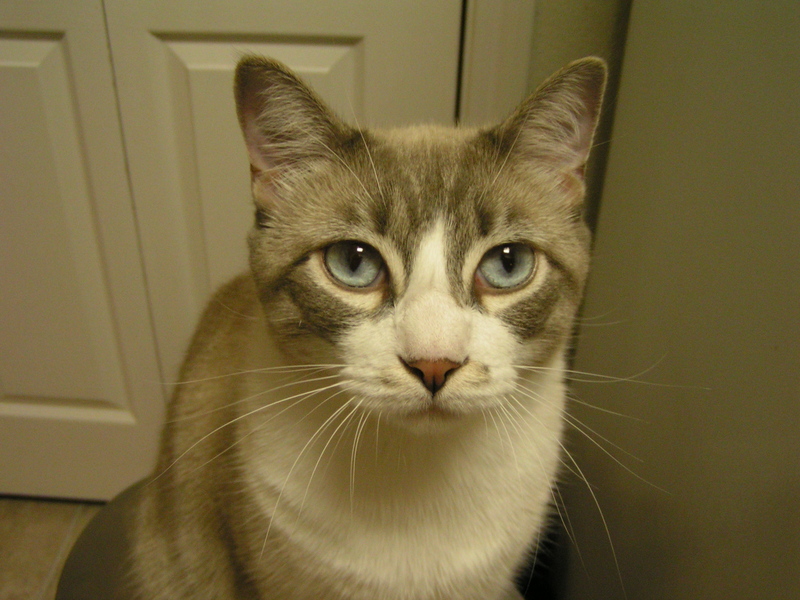 And don’t ever forget…Kitchen Kat is watching! I hope the ciabatta makes it here too!! O/T, but QueenBee has started a blog, too!